Closure to an event that began on Saturday, November 17, when Northrop Grumman's S.S. John Young Cygnus™ spacecraft was successfully launched on a mission to deliver supplies to the International Space Station (ISS), and today, Monday, the spacecraft has successfully docked at the ISS. Northrop Grumman Corporation (NYSE: NOC) announced that the “S.S. John Young” Cygnus™ spacecraft successfully completed its rendezvous and berthing maneuvers with the International Space Station (ISS) earlier this morning. The mission marks the company’s tenth successful berthing with the orbiting laboratory. 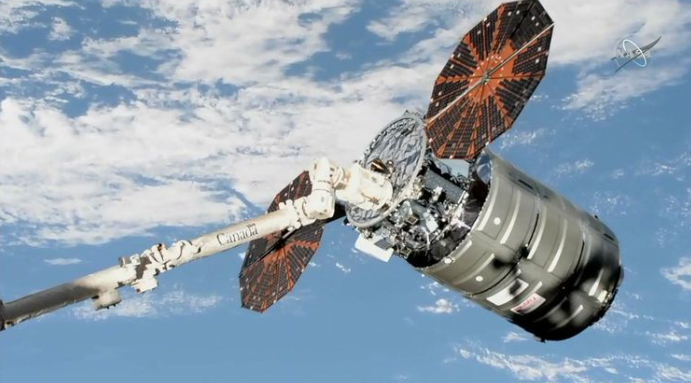 Northrop Grumman’s Cygnus spacecraft is shown moments after capture by the International Space Station’s robotic arm. Cygnus launched aboard a Northrop Grumman Antares™ rocket on November 17, 2018 from the Mid-Atlantic Regional Spaceport Pad 0A on Wallops Island, Virginia. As the spacecraft moved closer to the space station over the following few days, Cygnus executed a series of thruster burns to raise its orbit. Once the spacecraft was in close range, crew members on board the space station grappled the spacecraft with the station’s robotic arm at 5:28 a.m. EST. Cygnus was then guided to its berthing port on the nadir side of the station’s Unity module and officially installed on to the space station at 7:31 a.m. EST. Cygnus arrived at the space station with nearly 7,400 pounds (approximately 3,350 kilograms) of cargo, supplies and scientific experiments. The crew is now scheduled to open Cygnus’ hatch and make initial ingress into the cargo module to begin unloading the pressurized cargo. Cygnus will remain docked at the station for approximately two months before departing on secondary missions. Once Cygnus is unberthed from the station, it will reposition to deploy three CubeSats via the NanoRacks External Cygnus Deployment Program from both above and below the space station. This specific satellite deployment operation marks the first dual altitude deployment for Cygnus, demonstrating the spacecraft’s capability beyond cargo delivery and removal. The CubeSat known as MYSat-1 is among NanoRacks’ customers to be deployed and marks the first satellite developed by Khalifa University in Abu Dhabi, United Arab Emirates (UAE). MYSat-1 was developed as part of Khalifa’s Space Systems and Technology Concentration, a joint program established in 2015 in collaboration with UAE-based satellite operator Al Yah Satellite Communications Company (Yahsat) and Northrop Grumman. Engineers from both companies helped develop the initial curriculum for the concentration, and provided guidance and mentorship during the design phase of the MYSat-1 satellite. Cygnus is also prepared to execute on the inaugural flight for the Slingshot CubeSat Deployer System which is another example of the cargo vehicle’s ability to meet multiple customer needs. Slingshot is a flexible platform that can fly hosted payloads and CubeSats. NASA astronauts will install the system on Cygnus after the primary mission is completed. Upon completion of its secondary missions, Cygnus will perform a safe, destructive reentry into Earth’s atmosphere over the Pacific Ocean.